First off, I’m not quite sure whether ’Piritta’ is the name of the female vocalist of the band or if it’s just Finnish for ‘skinning cats’ – whatever it is, the sound of it is simply horrendous (check out Near Death Experience and have one yourself!). 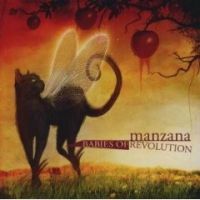 On their second album, Babies of Revolution, Manzana deliver nine tracks of perfectly unoriginal, punk inspired pop rock that’s about as interesting or dangerous as week old apple peels. A few catchy choruses here and there (particularly on the ‘hit’ End of the World) smeared on a background of fat nu metal-ish riffs and electronic bleeping just doesn’t do it for me. This is most definitely teenage pop metal of the worst kind, and there’s absolutely nothing revolutionary about it.